Controversial provisions of the Patriot Act authorizing government surveillance programs have expired after the Senate failed to vote for an extension. 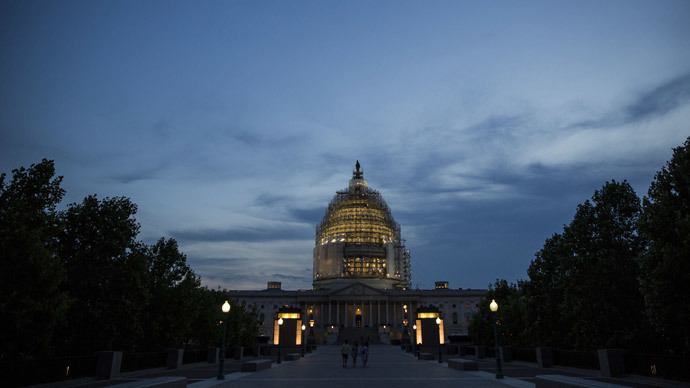 The Senate will reconvene to consider the USA Freedom Act on Monday afternoon. Lawmakers have debated the possibility of extending the authority of Section 215, that authorizes bulk data collection, and other provisions in the extraordinary Sunday afternoon session. The debate started at 4:00 pm local time, eight hours before the expiration deadline. The National Security Agency used Section 215 of the Patriot Act as the basis for collecting phone records of Americans who were not necessarily under official investigation. It was also used to track financial data and to obtain companies' internet business records. The extent of the mass surveillance program was revealed nearly two years ago by NSA whistleblower Edward Snowden. Two other sections that were not extended included the "lone wolf" provision that allowed targeted surveillance of people suspected to be terrorists, but not part of any group. The "roving wiretap" provision allowed the monitoring of a specific person, irrespective of the devices used. Letting the provisions “sunset” is regarded as victory by those who were against government surveillance programs. Supporters of the Patriot Act, however, said that the programs were of vital importance to US national security. Senate Democrats, including Minority Leader Harry Reid (D-Nevada) and Patrick Leahy (D-Vermont) called the conundrum a “manufactured crisis” and urged the chamber to pass the House-approved USA Freedom Act. Senator Rand Paul (R-Kentucky) asked for five minutes to speak, and overcame McCain's objections to do so. “We're not collecting the information of spies. We're not collecting the information of terrorists. We're collecting the information of Americans, all of the time,” Paul argued, reminding the Senators that Section 215 was ruled illegal by a federal court, and therefore extending it would be wrong. Paul blocked an effort by Majority Leader McConnell to vote on extending the two provisions of the Patriot Act unrelated to Section 215, the “lone wolf” surveillance and the “roving wiretaps.” That left McConnell with having to call for a cloture vote on passing the House's USA Freedom Act. That vote succeeded, with 77 for and only 17 against. What followed was a re-run of Paul's May 20 filibuster, with the Kentucky senator speaking till almost 8 pm, then ceding the floor to two like-minded Democrats, Ron Wyden of Oregon and Martin Heinrich of New Mexico. "Some people are secretly hoping for an attack, so they could blame it on me," Paul said, adding that he nonetheless believed one could oppose terrorism without violating the Constitution. Wyden and Heinrich spoke until after 8:00pm, past the time the NSA said it would be possible to continue the surveillance without interruption if the Senate re-authorized it. At that point, the temporary shutdown of the surveillance became irreversible, at least until a new law is passed. Senator Dean Heller (R-Nevada) told reporters that Edward Snowden's revelations absolutely played a role in the debate. “I think it played the same role for me as it did for most of the American people, who were surprised and stunned that the government had this sort of access to this kind of data,” Heller said. The Senate adjourned at 9:45pm local time Sunday, and would reconvene on Monday afternoon to consider the USA Freedom Act. Until then, the NSA's metadata collection will be on hold.